The stranger cat began showing up last year at the home of my Florida friend, Judy Ditfurth. He was one of the sweetest cats she had ever met…and that’s saying something! Judy, a woman in her mid seventies, has shared her home with cats and dogs all of her life. When the weather turned cold, Judy brought the visitor into her garage. 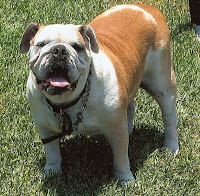 Judy was already sharing her life with her cat Cin, and two English Bulldogs named Toonie and Izzy, who had been brought home last year from the Bulldog Rescue group Judy works with. Each of these critters has ongoing health issues. 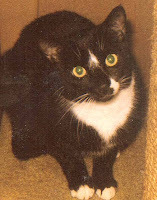 Bugsy came to Judy in 2008, after making a promise to a terminally ill friend that she would care for the cat. No one could have known how aggressive and unpredictable Bugsy would turn out to be. Both Judy and her veterinarian decided Bugsy could NOT be safely integrated into the rest of the family. So Bugsy began living – quite contentedly – in a room by herself. Judy had fallen in love with the stranger kitty, so euthanizing him was out of the question. However, finding a home for an FIV positive cat who would need to be isolated from other cats was going to be very difficult. And that’s when an idea was suggested – what about expanding Bugsy’s private suite into a room for two? Which is exactly what happened. It didn’t just happen, it happened effortlessly… as if it was always meant to be. The outside kitty was given the name Thomas, and Bugsy accepted him immediately. What you don’t know is that Judy suffered an unbearable loss on Christmas Eve 2008 – the unexpected passing of her beloved Bulldog, Jeremy. There are no words to express how deeply her heart had been broken. Yet, in the short time since the loss of Jeremy, Judy has provided a haven to three new critters who all needed a forever home. The world is overflowing with many special people, but I believe that some of them are truly angels…and Judy is one of them. People like Judy have some seriously good karma coming their way. It is wonderful that she has taken in these animals and given them homes in spite of their issues! Thank you for sharing her story! Judy is one very special lady, Tammy. You’re so right – lots of good Karma coming her way!